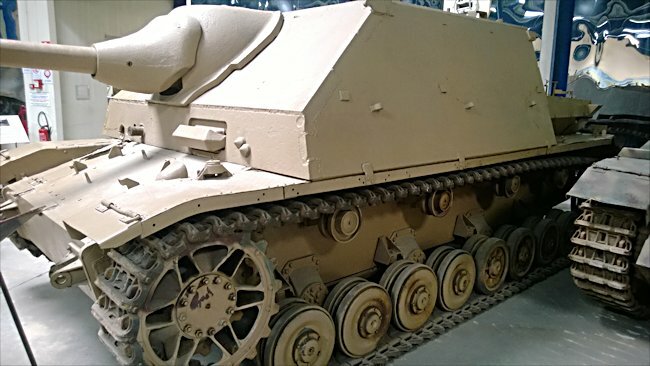 This German WW2 Jagdpanzer IV/70 (A) Tank Destroyer is taller than other Jagdpanzer IV varients as it is fitted with a bigger Gun the 75mm Pak 42 L/70; the same gun that is fitted on the Panther tank. It can be found at the French Tank Museum in Saumur in the Loire Valley. The Museum is called Musée des Blindés ou Association des Amis du Musée des Blindés, 1043, route de Fontevraud, 49400 Saumur, France www.museedesblindes.fr . The word Blindés means armoured. This Jagdpanzer IV/70 (A) was made at the Steyr-Daimler-Puch AG, Nibelungen, Sankt Valentin, Austria in 1944. It was knocked out and then captured by troops of the 3th DIA, December 1944, at Vosges in France, it was then used by Free French Forces. This is the only surviving Jagdpanzer of this model left in the world. It has some shell holes in the right-hand side of its front plate and there is still one lodged in the front armor plate. The urgent need for an adequate quick to build combat vehicle with upgraded anti-tank capabilities to face the Allied crushing superiority in numbers led to the rushed design of lesser expensive vehicles such as the Jagdpanzer IV/70A. 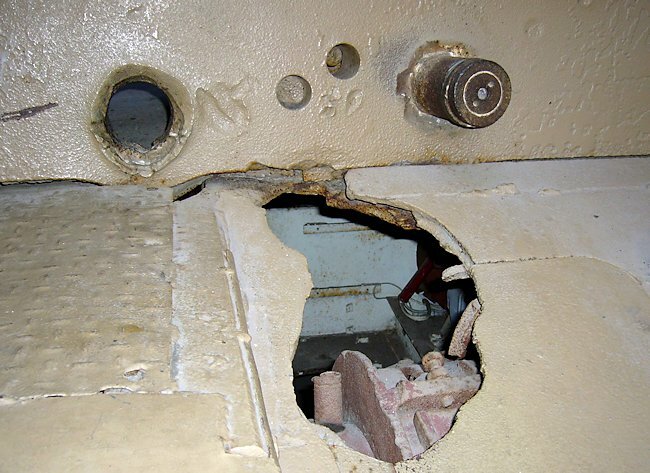 The remarkable gun of the Panther tank was fitted to the roomy panzer IV J chassis. Only 278 were built. It was 40cm taller than other versions of the Jagdpanzer IVs. The Jagdpanzer IV/70 (A) was the Alket version of the Panzer IV Tank Destroyer. It was produced between August 1944 to March 1945 by the German company Nibelungenwerke Alkett in Berlin. The suffix (A) stands for the subsidiary company Alkett that produced this variation of the Jagdpanzer. It weighed 28 tons had a crew of four. It had a range of 320 km and a maximum speed of 38 km/h. . This self-propelled anti-tank assault gun was built on the chassis of a Panzer IV Ausf. J. They were introduced into service on September 1944. Most were sent to the Russian Eastern front. Some were sent to Italy and the rest saw service on the Western front. Only one Jagdpanzer IV/70 (A) tank destroyer survived the war. This is one you find at the Musee Blindes in Saumur, France. 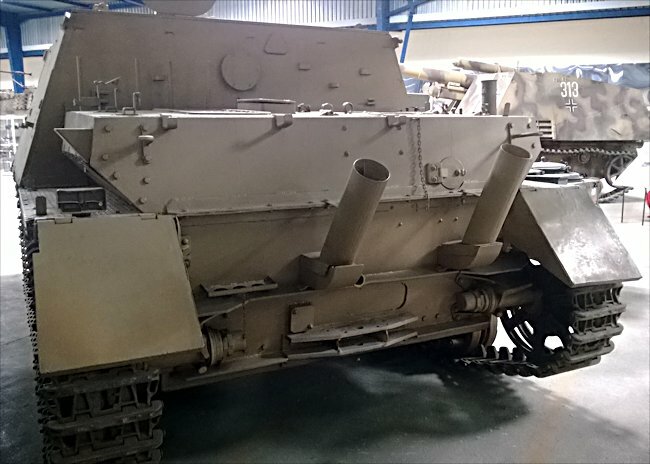 It was believed to be captured near Colmar after it was hit by multiple bazooka hits on the upper right front armour plating. This caused the side of the upper chassis armoured plate to fracture and the weld joints with the front armour plates to crack. There is also two hits just to the left of the front right track cover on front armour. Some reports say these hits were caused by Sherman tanks shells. It was used by the free French army 5th Armoured Division until the end of the war. Many captured and abandoned German vehicles were put into service by the free French army. Black-and-white photographs taken after this Jagdpanzer IV/70 (A) tank destroyer was captured shows that it had a camouflage paint job that appears to consist of lighter fist sized blotches painted on a darker background. On the photograph you cannot tell if the background colour was Brown or olive green. It had a small German army cross on the top left of the front armour plate. It also had a similar sized German army cross painted in the middle at the top of both side armour plates. These identify crosses are about the size of a human head. Unusually the top of the cross starts at the top of the armour plate. During the Battle of the Bulge in the Belgium Ardennes Jagdpanzer IV/70 tank destroyers were deployed as part of the German offensive. In the morning of 21 December 1944 the bulk of the 1st SS Panzer Division massed on the hills between the villages of Trois-Ponts and Wanne. They were looking for a place to cross the river Ambleve. Heavy armour starts to move downhill towards the Petit-Spai bridge. A Jagdpanzer IV/70 tank destroyer was the first vehicle to try and get across on the bridge. Unfortunately, the weight of the Jagdpanzer IV/70 was too much. It brought the flimsy structure down around it, leaving it half submerged in the centre of the River. The crew managed to get out but the Jagdpanzer IV/70 was left stranded in the water. Pilots from the United States air force tried to claim the destruction of the bridge resulted from an attack by their P-47 Thunderbolts. German 1st SS Panzer Division after battle reports showed what really happened. During the Battle of the Bulge on 31st of December 1944 in the Belgium Ardennes, American Brigadier General Kilburn of the 11th Armoured Division had high hopes of crashing through German resistance and capturing the town of Mande-Saint-Etienne. By midday. They had a lot to learn for the German 3rd Panzergrenadier Division were ready for them. Although initially they had success with the help of some fighter-bombers in taking the village of Rechrival they had problems the next village of Chenogne. Advancing American troops forced their way into the village that were thrown out by a small German counter-attack backed up by a group of Jagdpanzer IV/70 tank destroyers. 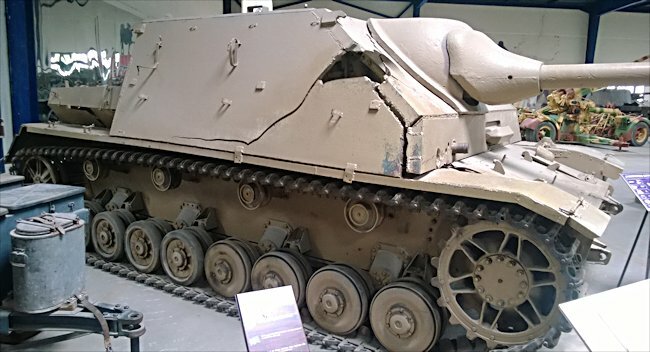 This German WW2 Jagdpanzer IV/70 (A) Tank Destroyer has some shell holes in the right-hand side of its front plate and there is still one lodged in the front armor plate. The Americans had to take this town as it was blocking the way towards their final objective. Kilburn called a halt and obtained reinforcements. He arranged for the village to the bombarded by artillery on New Year's Day prior to two companies Sherman tanks heading up the renewed advance. The same group of Jagdpanzer IV/70 tank destroyers knocked out four of the advancing M4 Sherman tanks. The others reached the ruins of the village along with supporting infantry units. The German troops and armour, retreated to find a better defendable position. When orders were given to break out the leading platoon Shermans chose to drive through the fields through fear of the roads being mined. They got stuck in the mud and snow. This enforced halt was fatal as German Grenadiers were waiting for just such an opportunity. Within minutes Panzerfaust handheld rockets had wiped out every Sherman tank in the platoon. The Germans were waiting for the Americans yet again when they reach the village of Bois des Valets. They burst upon the American advancing column. The battle went on for three hours in the panzers knocked out a considerable number of the American Sherman tanks. They were only defeated because of the Americans ability to call in artillery and fighter bomber support.